Marie Kondo is on to something: If you want to rediscover joy in your cluttered digital life, half measures are unlikely to work. By Cal Newport, author of "Digital Minimalism"
For many, 2018 was a year of mounting frustrations with personal technology. Negative stories piled up about the varying abuses and misdirection of social media services — privacy violations, censorship, knee-jerk outrage — while at the same time, Apple rolled out its Screen Time feature, revealing to millions of iPhone users the unflattering reality of how many hours they actually spend each week staring at a little glowing rectangle. Given these trends, it makes sense to make 2019 the year we reform our digital lives. The question, however, is how to succeed with this goal. To simply resolve to look at your screen less or implement hacks such as turning off notifications isn’t enough. My research indicates that a broadly similar approach is what works best for your digital clutter as well. To simply resolve to look at your screen less or implement hacks such as turning off notifications — the digital equivalent of trying to be cleaner or buying smarter organizers — isn’t enough. The technological and cultural forces pulling your attention back to your screen are too powerful for small tweaks to aggregate into large lifestyle changes. What does seem to work is to clean out your metaphorical closet: Step away from all the optional apps and services that you’ve haphazardly downloaded in recent years, and then add back only the tools that are really important to living a meaningful life. The more detailed process I propose is called the digital declutter. It asks that you begin by taking a 30-day break from optional digital technologies in your personal life. These include any apps, services, or web sites that aren’t necessary for your work or play a vital role in your daily routine. For most people, these optional technologies include social media, online news and entertainment sites, games and streaming videos. For technologies that play both a vital and a distracting role, specify rules to separate the former role from the latter. For example, if your job requires you to occasionally post on your company’s social media account, this shouldn’t be an excuse for unrestricted social media browsing on your phone. Instead, put aside some set times on your calendar to complete your professional social media work from your office computer, and then otherwise avoid these services during the declutter period. There are two motivations for taking a 30-day break. The first is to detox from the compulsive urge to tap a screen at the slightest hint of boredom. It’s difficult to think clearly about your digital life while you still feel an addictive pull to its algorithmically optimized charms. The alluring noise emanating from our screens provides an easy distraction from the bigger questions about what really matters. The second purpose to this long duration, however, is arguably more important: to get back in touch with what you actually value. The alluring noise emanating from our screens provides an easy distraction from the bigger questions about what really matters; what we want to do with limited time here on earth. This month-long reprieve provides the space needed to revisit these questions, and through both self-reflection and experimentation, form some tentative answers. 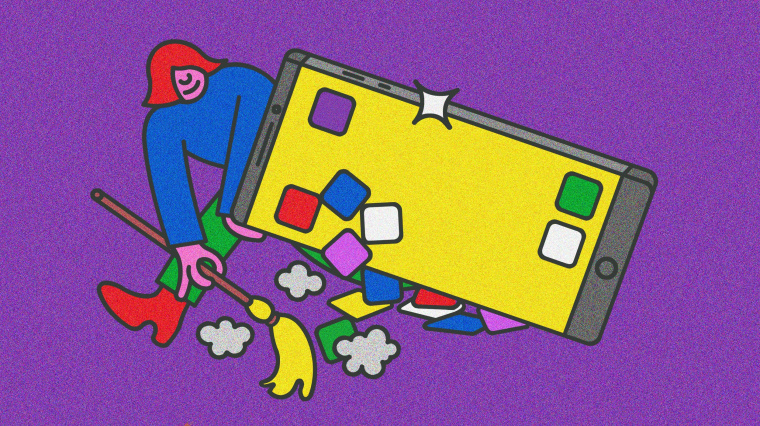 At the end of the digital declutter, you must resist the urge to simply return to the same digital life you fled a month earlier. Like a Kondo aficionado carefully deciding what shoes to put back in the closet, only add back digital tools that significantly support one of these values you recently identified during your self reflection. And when you do add back such a tool, don’t allow its use to be unrestricted — instead place some careful rules about how and when you use it to maximize the deep benefits it provides while minimizing its costs. If Facebook groups are key for keeping up with a community group that’s really important to you, for example, don’t allow this reality to justify mindless Facebook browsing during every moment of boredom. You might instead remove the Facebook app from your phone and enforce a simple schedule in which you log on to the site on your desktop computer on Sunday nights to review the latest announcements from the group. Similarly, I’ve heard from multiple declutter veterans who tamed a Netflix binge-watching addiction with a simple rule: They never stream shows alone. This trick maintains the relationship-building value of movie night, while avoiding using reruns of “The Office” as a mindless escape from issues that would benefit from direct confrontation. A little over a year ago, I asked my readers if anyone would be willing to attempt this digital declutter and then send me some thoughts about the experience. I thought a couple dozen brave souls might take on the challenge. In the end, over 1,600 signed up. In addition to emphasizing the hunger so many now feel toward rethinking their relationships with their screens, I learned an important lesson from their experiences: Marie Kondo is on to something. If you want to rediscover joy in your cluttered digital life, half measures are unlikely to work. Gather the courage to start from scratch. Clear out all the junk that has haphazardly piled up on your devices, get back in touch with what you actually want to do with your time, and then put these tools to work making your life more joyful instead of allowing them nudge you into a joyless, distracted, screen-addled existence. This piece is based on Cal Newport’s new book, "DIGITAL MINIMALISM: Choosing a Focused Life in a Noisy World," now on sale from Portfolio, an imprint of Penguin Publishing Group. Cal Newport is a computer science professor at Georgetown University. He is also the author of six books, including most recently The New York Times bestseller, "Digital Minimalism: Choosing a Focused Life in a Noisy World." His work has been published in over 20 languages and has been featured in many major publications, including the New York Times, Wall Street Journal, New Yorker, Washington Post, and Economist.